It was a great pleasure for me to work with Prof. Bhandari, particularly during his two year term as Chairman of Management Development Programmes (MDP). We used to meet him almost daily in that period. Even before he took over as Chairman MDP, I would meet him occasionally for programmes that he was teaching, for case materials, etc. I remember that he had designed a novel, one-week programme on Product Policy and New Product Development/Management. The first programme was held in Goa. It was a major success. Later, it was shifted to the Management Development Centre (MDC) and IIM-A continued to offer the programme on a regular basis every year. Prof. Bhandari was regarded as a marketing guru, and many organizations would just send their executives for the programme so that they would have a chance to meet and interact with him. He would send special mailers to top-level executives in marketing and they would respond immediately and positively. Such was his charisma in the Marketing community. When he was made Coordinator for the Top Tier of the 3-Tier Programmes, he made significant changes in its structure. He made it as a theme-based conference and admitted only the very top-level executives and rejected many nominations who would have otherwise found admission in earlier years in the same Top Tier. Many big companies were taken aback, but he stood his ground saying that once the companies understand our message, they will think twice before sending nominations for the Top Tier. At least for the two years that he coordinated the Top Tier of the 3-TP, he followed this policy. Also IIM-A continued to offer the Top Tier as a theme-based conference in later years. In 1983, Prof. Bhandari started his two-year tenure as Chairman MDP. He told us that we should run the Management Development Centre as a cost-profit centre. Earlier MDP committees from the very beginning used to fix room/board tariff on an ad-hoc basis, raising them marginally every 2-3 years. The rates were abysmally low, and had no relationship to the cost of operations. Prof. Bhandari collected details from accounts and other relevant departments about the cost of constructing the building, installation of AC plants, furnitures/fixtures, annual electricity bills, provision bills for a year, laundry services, purchase of crockeries/cutleries, linen items etc. etc. and arrived at cost per participant on the basis of different occupancy ratios. Thereafter, the room and boarding tariff was fixed at realistic levels. It was during Prof. Bhandari's tenure that the Advanced Management Programme (AMP) was developed and offered in collaboration with the Bureau of Public Enterprises (BPE). The first AMP had been offered by IIM Calcuttta a couple of years before.1. At the specific request of BPE, this programme was taken up by IIMA after discussion with BPE by then Director, Dr. I.G. Patel and Chairman MDP, Prof. Bhandari. Initially one programme was to be conducted by us. The facilities at the Management Development Centre were at a primitive stage at that time. As the AMP was an important programme for IIMA, Prof. Bhandari wanted to enhance the facilities at MDC (airconditioning the dining hall, auditorium, basement class rooms etc., adding a library counter, reading room etc). Director was in full and complete support of his initiative and requested the then Chief Engineer, Mr Nirbubhai Desai to execute whatever modifications were requested by Prof. Bhandari, to start the work immediately and complete it in record time before AMP’s commencement. Director told Mr. Desai not to bother about financial sanction etc. as he would take care of it himself. He was given carte blanche to accomplish the task, which he did remarkably. Even today, MDC's old block is as per the modifications/improvements requested by LRB – except that the computer lab. was shifted to one end of the reception lobby. During his tenure as MDP Chairman, Prof. Bhandari preferred to hold meetings with visitors etc. at the MDC (even on Saturdays/Sundays/Holidays). Many outside visitors used to wait at MDC to meet him and he would telephone me from his residence about expected visitors for meetings. Looking to the huge cost involved in improving the infrastructure, we asked BPE to allot at least two AMPs for IIMA to partly offset the cost, which they readily agreed. We had about 30+ participants – It was designed in three modules – the first module was four weeks at IIM-A (Academic), 2nd module involved a foreign visit for about 2 weeks (to understand the practices/policies followed by PSUs in that country) and third module at New Delhi – with Government Interface – where participants used to visit various ministries, PSUs etc., followed finally by presentation by the groups before BPE officials and secretaries to GOI and other invitees of BPE. Two groups were formed for the overseas trips. One group went to Japan. Prof. Bhandari took care of this group and he visited in advance for preparation before the programme’s commencement.2. The second one was to Hungary, probably led by Prof. GR Kulkarni. 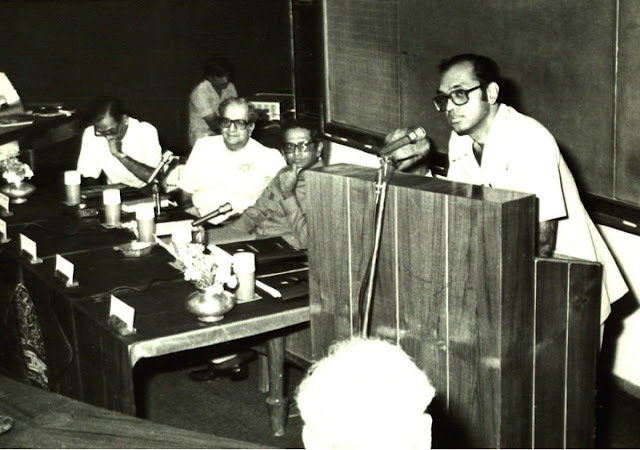 LRB addressing the inaugural session of the Advanced Management Programme on the 2nd of July, 1984. On the dais are Mr. SM Krishna, then Minister of State for Finance and Industry (3rd from left), and RP Billimoria, Chairman of the Bureau of Public Enterprises (2nd fro left). After the AMP, Prof. Bhandari talked to me and my boss Mr. K. Rajagopal (Programmes officer, MDP) and said that to recoup the huge expenditure that was incurred for the MDC upgrades, whether we could also host the 3-Tier Programmes. The 3-Tier Programme, one of IIM-A's prestigious programmes was a 2 month programme for three tiers of management – middle, senior, top level executives. This programme usually ran into over 100 participants, with about 25-30 in the Top Tier, and IIM-A had historically held it in other locations such as Agra, Jaipur, Goa etc. My boss and I readily agreed to his suggestion of hosting this big programme at the MDC. LRB wrote an appreciative communication to the Director, saying that he had discussed the possibility of hosting 3-TPs at IIM-A with his colleagues (myself and my boss – he equated us as colleagues) and that they were confident of handling the programme without difficulty. In that communication he worked out the cost savings for the Institute for holding 3-TPs on the campus over a period of time. This probably enabled Director to convince the Building committee members about the cost effectiveness on the investment. I also have vivid recollections of seeing Prof. Bhandari outside of work. I had a habit of coming in to work very early in the morning and working late. As a result, I often saw him in the morning or evenings during his walk in the campus with a small kid on his shoulder and a slightly older kid walking along with him, holding one of his hands. His sudden death came as a shock to me personally and also my other MDC staff. I still cherish my association with him. *Mr. S. Santhanam was a colleague of LRB at IIM-Ahmedabad. He administered the Kasturbhai Lalbhai Management Development Centre and worked closely with LRB during the latter's stint as the Chairman of Management Development Programmes. 1. Prof. Dharni Sinha, in his memoirs, claims that the AMP was, in-fact, first developed and offered by the Administrative Staff College of India in collaboration with the Bureau of Public Enterprises and that IIM-A copied its overall structure, including the foreign visit module. See: Sinha, D. Learning from Life, p203, Excel Books, 2007. 2. N. Ravi, who was then the First Secretary (Economic and Commercial) at the Indian Embassy at Japan, has given us his account of this trip by LRB with the AMP participants. While in Japan, LRB also found some time to have meetings with Toy manufacturers in connection with diversification opportunities that he was exploring for Enfield India, where he was a member of the Board.